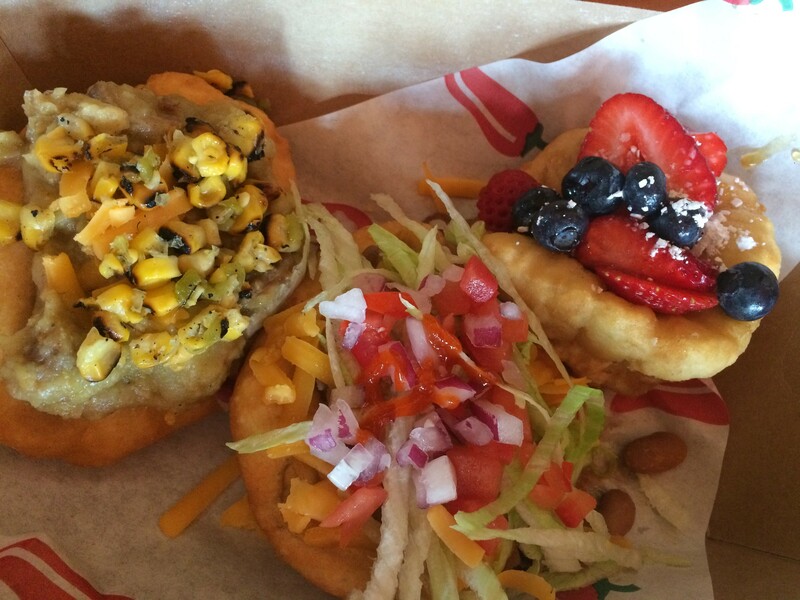 Now, fry bread has taken on a life of its own. In Arizona, Navajo tacos were voted the state dish in 1995. South Dakota designated fry bread as the official state bread in 2005. Sweet fry bread, often seen at state fairs, is also known as elephant ears. Yazzie runs Rocko’s Tacos at The Lodge (3758 Piedmont Ave., Oakland) on Sunday, Monday, and Tuesday evenings, serving his version of Navajo tacos. The typical way of eating it is simple: “Fry bread and beans is what you’re usually eating. It’s what you would get on a reservation. It’s super OG,” Yazzie said. Yazzie’s fry bread is made from flour, baking powder, salt, and warm water. Slightly crunchy on the outside, and pillow-y on the outside, it’s the perfect palm-sized comfort food. Typical toppings can include a combination of beans, beef, lettuce, tomatoes, and shredded cheese. Yazzie, a Scottsdale Le Cordon Bleu grad, adds his own flair. Think fry bread with hatch green chili sauce, pork potatoes, and roasted corn salsa. Or a vegetarian Navajo taco with New Mexican red chili beans, cheese, and tomatoes (vegan without the cheese). A sweet one could be dusted with powdered sugar, drizzled with honey, and filled with fresh strawberries and blueberries. When Yazzie first started, he was cooking on a camp stove on an ironing board outside of a San Francisco bar, Pops. He gained a following over time and ended up cooking at El Rio for five years. Yazzie is also a part of Turqouiz Noiz as a guitarist and vocalist. It’s an indie rock band that he describes as “ratchet rock” and “powwow punk.” His other job is working at Helios in West Oakland as a stained glass builder. Yazzie hopes to one day start his own restaurant, serving Southwestern food and traditional Navajo dishes. While seemingly simple, these comforting dishes belie Yoon’s cooking pedigree: He also makes seasonal farmers market salads that are fit for a Sunset Magazine photo shoot — think fig and tomato salad from Fully Belly Farm with blue cheese from Point Reyes.